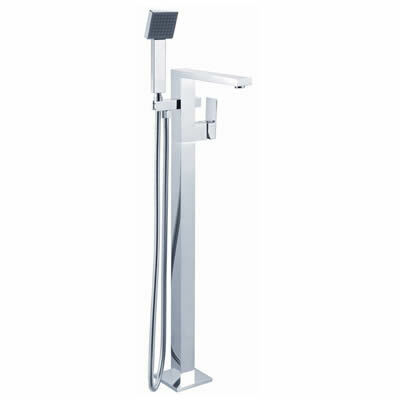 The Cube Freestanding Bath Mixer with Hand shower is a practical addition to any bathroom. It features the perfect blend of practicality, style and affordability in the one single package. Furthermore, not only does it deliver great value for money, but it is also designed for easy installation in any bathroom. You really cannot go wrong! The Cube Freestanding Bath Mixer features a modern design with a long hose on the main tap and a stylish handheld shower unit. The hand shower can be activated by pulling knobs located under the spout. 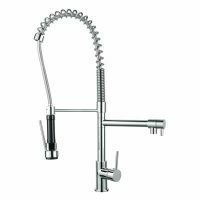 Water flow automatically gets turned back to the main tap unit once the hand shower unit is shut off. 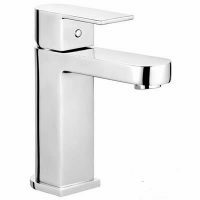 This highly durable unit is manufactured with solid brass construction and features a modern chrome finish, with additional chrome cover hides over the floor brackets. 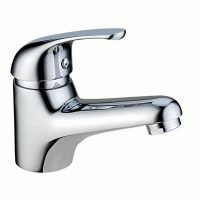 Outlets for hot and cold water lines are included. The Cube Freestanding Bath Mixer is a Watermark and WELS approved product that boasts a 3-star WELS rating and a water consumption rate of 8 litres per minute. For bath mixer sets that offer exceptional performance, choose the Cube Freestanding Bath Mixer with Hand shower. Get yours today from us at Ross’s Discount Home Centre.